On Sept.17 CSUSB faculty announced the opening of the new residence hall and dining area, Coyote Village and Coyote Commons with a ribbon cutting ceremony hosted in the courtyard of Coyote Village. The Coyote Village is the first of several residence halls that are meant to open in the future at CSUSB. These new facilities aspire to encourage a unique and positive college experience for incoming freshman and transform CSUSB into a mostly residential campus. The hall is now home to over 400 new students and features multiple living amenities for residence to enjoy. The building stands at 114,000 square feet, and includes study and recreation rooms, lounge areas, community kitchen, laundry facilities, a courtyard and many other features. The Coyote Commons located next the Village and stands at about 50,300 square feet. It features a new all you can eat dining experience at CSUSB that is open to all students, staff and faculty. For a set price, the all you can eat style buffet offers a variety of food stations that provide both vegetarian and vegan options. Some of the options that are available for a set price include: Pizza and pasta, a Mongolian grill, desert bar, a traditional grill, and a salad and deli bar. During the week the commons are open for breakfast lunch and dinner. The commons building also features a coffee shop, and the Coyote Market where students have the option to purchase food by items as opposed to the all you can eat option in the main dining area. This area of the building also allows students the chance for late night dining. “My schedule this quarter has me staying on campus all day. The new commons is a place I can rely on that is readily available, even late-night,” said Emmanuel Tanopo, a communications major at CSUSB. In addition to different food options the commons provide social areas both inside and outside for anyone to relax in. The building allows seating for about 700 people which incorporates a private dining room. Outlets are all around the building to ensure a place to study while enjoying a meal. 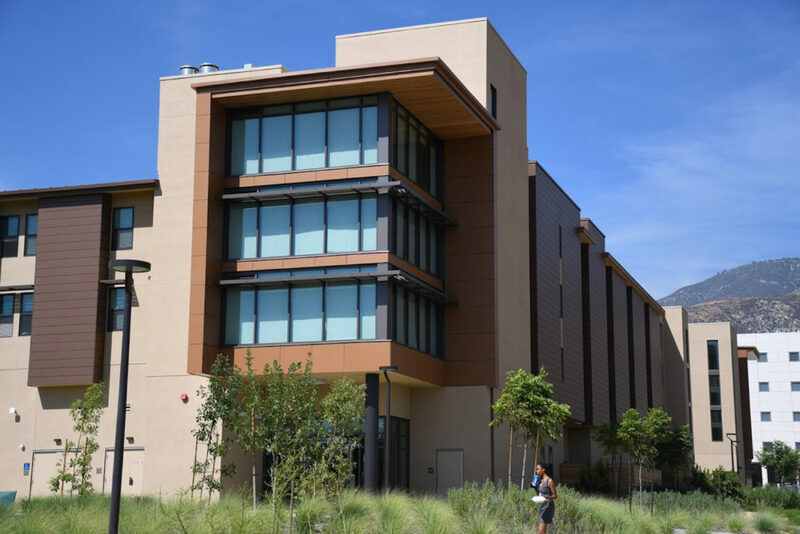 The cost between both the Coyote Commons and the Coyote Village amounted to $95.8 million, which was all funded by rental rates of campus residence halls. This makes these buildings the largest single capital project in the history of the university. Some of CSUSB’s departments who contributed to the making of the Coyote Village and Commons are the Planning and Managing department, Student Affairs, Housing and Residential Education and Associated Students Incorporated.